It was Women in Mission Sunday at Trinity Lutheran Church, Missouri Synod, located at 701 E. Florida Ave., Urbana. The women’s mission group, Pieces of Love, had created colorful quilts and blankets. The items will be shipped to Kenya, but on that weekend they were blessed at their worship services Saturday at 5:30 p.m. and Sunday at 8:30 and 10:45 a.m.
“We had the quilts and tie blankets out on the pews for that Sunday,” Jennifer Holhubner said of the brightly made pieces that were everywhere in the church. 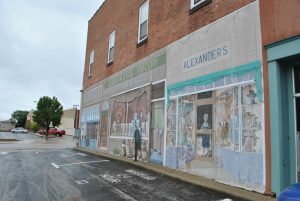 Holhubner said that Pieces of Love meets every other Wednesday with a handful of women who sew fabric pieces with love. They have fun and fellowship, too. Holhubner is the leader of Pieces of Love. “We started out with maybe five women at first, and over the years we have grown,” Holhubner said. She said that even some of their homebound ladies work on quilts and blankets for the mission from their homes. “Like Mary Williams, who even though she is homebound with cancer, she works with quilt squares and makes things for us,” Holhubner said. 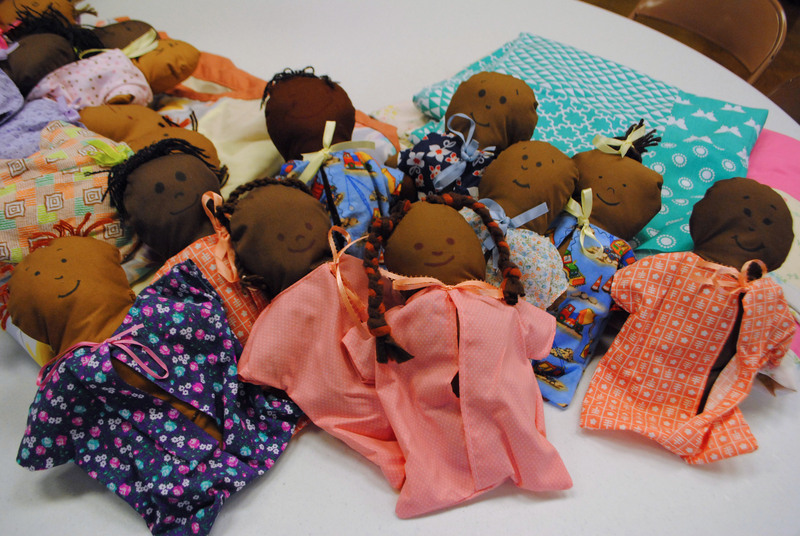 While many Lutheran churches make quilts and blankets, the ladies at Trinity do a little bit more: They make baby dolls. “Eight years ago, Jan Brooks did a presentation on how there are no brown baby dolls to be found in South Africa, which is ironic because most people in South Africa have brown skin,” she said. Brooks teaches drumming and works with the musical ministry in the church, as well as the Pieces of Love ministry. “The first year I went to South Africa with students, (during) winter break in 2007-2008, we noticed that the kids in the impoverished townships did not really have toys. They played with rocks, seashells, discarded boxes or crates that they found in the community, and pieces of wire. They were creative with these items, and I mentioned to the students that this kind of creative play related to their own communities, did not cost money and in fact provided thinking and problem-solving skills. The kids played with each other, which is good for social skills. We then saw a couple of kids with Barbie dolls that were gifts from a tourist wanting to help them. We were critical of the kids being given blond-haired, blue-eyed Barbie dolls. It just reinforced the ingrained idea that white was better. We decided to buy the kids where we worked dolls with brown skin, but all the toy stores we could find in Cape Town only had white dolls and, of course, they were expensive,” Brooks said. Instead, they took the kids soccer balls and jump ropes, and they played with the kids. “We asked them to teach us about their games,” she said. When Brooks came home to Urbana, she relayed the story to Holhubner. Brooks said that Holhubner came up with an idea to make fabric dolls with brown skin. “Jennifer found a pattern with a simple outfit to dress them in. She did this as a Girl Scout project and gave me dolls to take on my trip to give away. In return, I did some other learning activities about Africa with her Scouts. Since the first batch of dolls went with me in 2008-2009, we’ve gotten together — sometimes with more Scout troops, and sometimes with a student organization grounded in my department called the Child Life Association — and made dolls every year,” Brooks said. The doll idea has expanded. When Holhubner went on Trinity Church’s mission trip to Haiti, they made dolls for the children there, too. Holhubner has come up with many different dolls as the group became more experienced. She has come up with a variety of clothing and hairstyles for the cloth dolls. Kids hold a doll, when she has them. To make the perfect Craftsman-style house, an architect took two nearly identical A-frames that were blocks apart and joined them together in one light-filled home on Church Street.